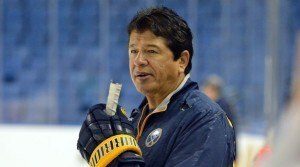 No matter how you view Ted Nolan, one thing is for certain: he’s now unemployed. After guiding the Buffalo Sabres to back-to-back 30th place finishes, Nolan was relieved of his coaching duties by general manager Tim Murray on Sunday night. The news comes just hours after the players held their locker clean out day at First Niagara Center. Along with Nolan, the Sabres let go assistant coach Danny Flynn, and decided to not renew the contracts of assistants Bryan Trottier and Tom Coolen. The one man who did make the cut, for now, was goaltending coach Arturs Irbe. Murray revealed that Irbe still had one year remaining on his contract, and that the next head coach of the team will have a say in his status on the staff. If it was up to me, I’d bring him back after seeing what he was able to do with Anders Lindback. Before joining the Sabres, Lindback posted a .875 save percentage and a 3.71 goals against average with Dallas. In Buffalo, Lindback had a 2.76 GAA and a solid .924 save percentage. Despite Murray’s claim that the decision was made after speaking with players for hours on Sunday afternoon, Nolan’s firing was expected by many both inside and outside of the Sabres organization. He was a coach that was brought in to be, what many believe, the scapegoat after achieving Murray’s ultimate goal of landing either Connor McDavid or Jack Eichel in the 2015 NHL Draft. Murray then brought up the fact that Nolan didn’t seem too pleased about not having a say in the trades that were made around deadline day. Murray admitted that he felt a GM not consulting a coach about trades is a normal business practice, though he could see how others wouldn’t feel that way. With Nolan out of the picture, the Sabres now have to begin a search for the 17th coach in the franchise’s 45-year history. It’s common knowledge, thanks to TSN’s Darren Dreger and Bob McKenzie, that the Sabres will go hard after current Detroit Red Wings head coach Mike Babcock. And it’s believed that, should Buffalo land McDavid, Babcock could be persuaded to leave the organization he’s coached for the last decade. BUF GM Tim Murray has history with Babcock dating back to days in ANA. Sabre owner Terry Pegula has lot of $ and not likely to be outbid. That being said, with Murray’s belief that it’s okay for the GM to not talk to a coach about a trade before making it, that could lead to Babcock not wanting to come aboard with the Sabres due to his liking to have say in the makeup of his roster. Murray is expected to begin the search for a new coach soon, but won’t place a timetable on when he wants to have his decision made. “I want to have the biggest pool of good candidates I can get,” he said. Other candidates that the Sabres could target in the offseason include current Binghamton Senators head coach Luke Richardson and former Pittsburgh Penguins bench boss Dan Bylsma. More details regarding potential candidates should be known in the coming weeks. Right now, it’s clear that Murray’s focus is all about the NHL Draft Lottery where Buffalo has the best odds to land the number one overall pick at 20%.